Seth became nineteen just yesterday. He left his family to finally fulfill his lifelong dream – enter the service of the airship for captain Strata. Before the ship even left port, he was constantly pacing back and forth on the deck, fascinated, looking at the height of the masts and sails. He held his breath at the thought, that those hanging wooden fins now harmlessly hanging along the hull, will be harvesting clouds for fuel – rare phlogiston. Parents warned him before the sky pirates, but he just waved his hand. He believed, that Sky Guild will protect them, just as it does its job for several decades. Simultaneously, he knew, that flying offers numerous other hazards. But they were still only traders, what could happen? When they set sail, his question has got a relatively quick response. From other sailors stories, he had learned, that there is mysterious and probably very valuable cargo on board their ship, and their job is to transport it safely to the capital. From then on, he continued to perform his duties, but he held his breath every time a growing skyline of other ship appeared on the horizon. Pirates, he has thought, but it was just another businessmen. And then, when he finally began to believe everything is allright, pirates have finally arrived..
And even you have certainly sometimes wondered, what it’s like to sail in the clouds and enjoy the wind in your hair. No noisy engines, only the magical forces of nature and a bit of science to it. Someone fulfilled his dream with a balloon, while the others will play Sky Traders. 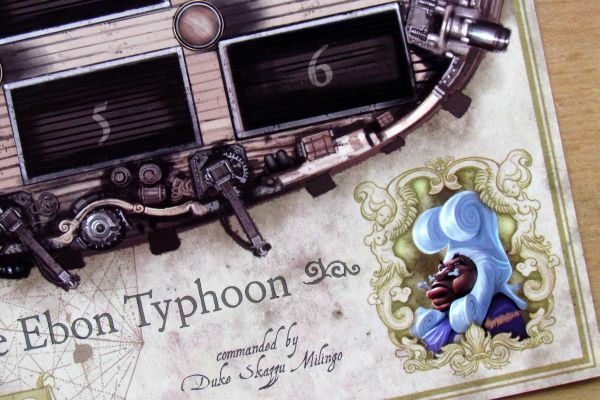 Game from Fantasy Flight Games was created by the Italian Gioacchino Prestigiacomo and beautiful illustrations are presentation of crafty illustrators – Miguel Coimbra (7 Wonders, Arcana), Nicolas Fructus (Takenoko) and Christophe Madura. Sky Traders are new game for 2012. 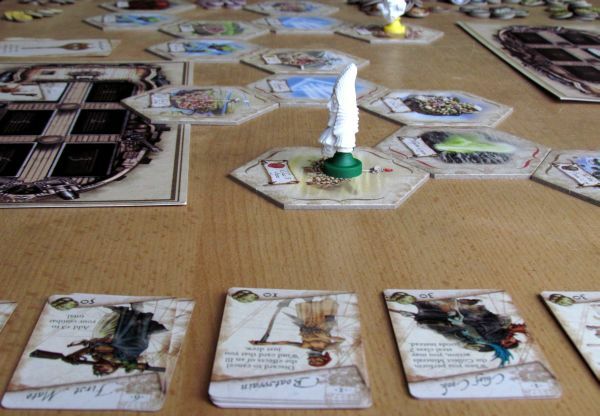 This board game belongs to series of larger and more advanced games, as we will soon see. 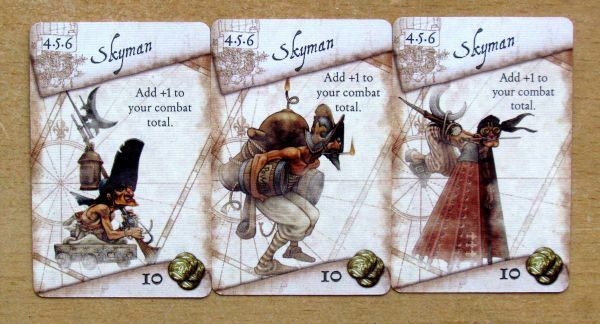 Cards are often wearing a short text in english, so knowledge of a english language is necessary this time, despite the fact, that Sky Traders are essentially a fairly simple game. Even from lid of the box, you can easily feel the atmosphere of beautiful colored world filled with adventure. And it even does not change, when you take your hand and turn pages in the guide. It is presented beautifully, full of elegant illustrations and layout with complete care. 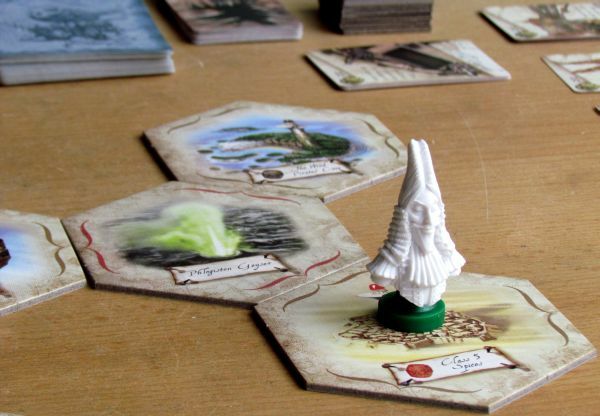 You may become a little scared of its thickness, but the rules themselves are beginning on page 14 and on page 24 you can basically start playing. Additionally, other space in the pages is occupied by illustrated examples, which will help you understand everything on the first try. 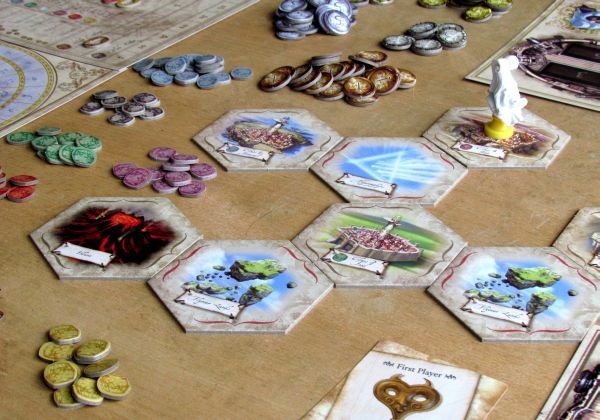 But now we should tell you, what will you actually have on the table, while playing those lofty traders. 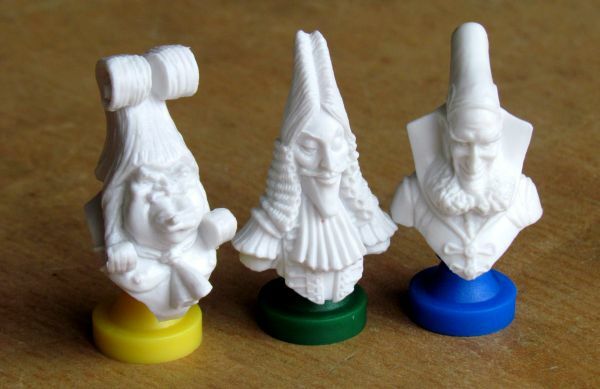 You yourself will become one of five busts. Each character is different, and also has a different base color to be clearly visible. This figure will indicate your position on the world map. 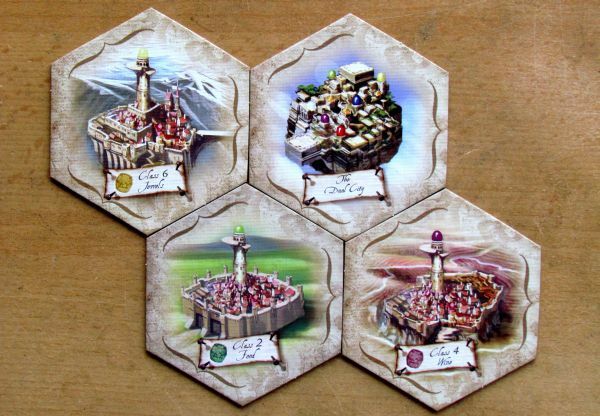 World is assembled of fourteen large hex pieces, where you will find various pictures of cities, clouds, flying plains, but also phlogiston geyser or volcano. 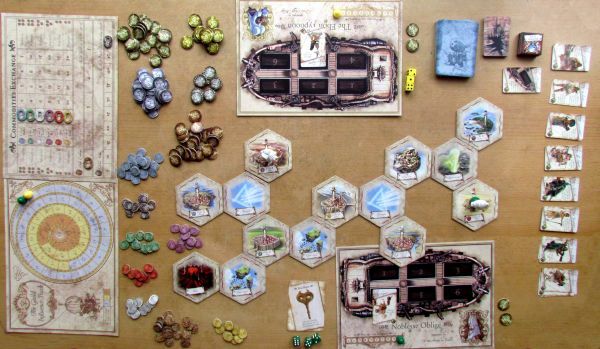 These pieces have a small label describing their specific resources and some sides contain red or brown arrows essential for the preparation of the game plan. 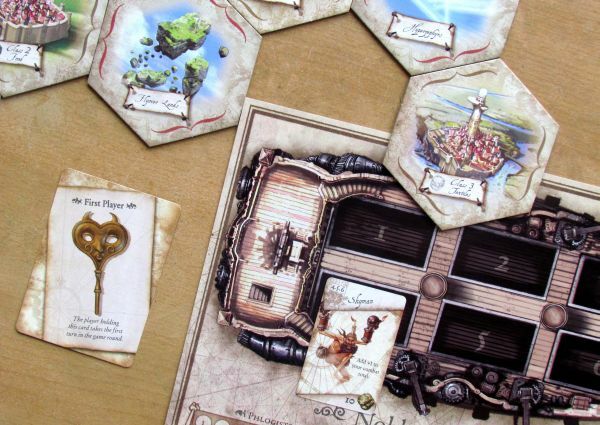 In addition to these pieces of locations, which immediately reminded us of Ventura (review), you can see also ship cargo space cards made in color of each player. The ship has six places in its hull, where you can store goods and transport them – two barrels of materials fit in one of them. In bottom of ship silhouette there is a measure of fuel, which gives all those ships moving capabilities – behind that is severally mentioned phlogiston. 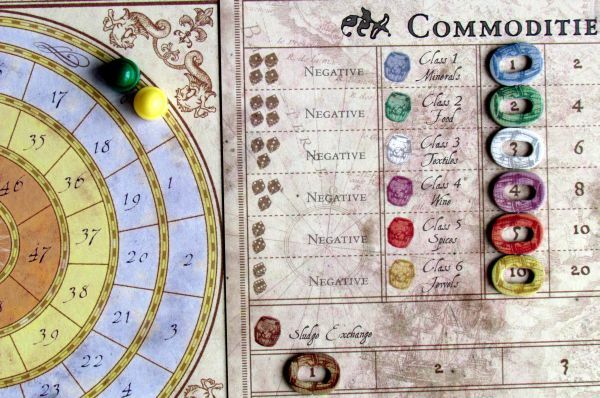 Then there are two common tables – one will indicate the price of eight kinds of goods on the market, the second is the spiral path tracking victory points. Players start at the outer edge and gradually work their way to the center, where they can experience fifty influence and victory. Now we are waiting just for chips and cards, but both come in relatively large numbers. Cards are of five distinctive species – the first deck contains Ill Winds cards, which can harm or help you, but their effect can not be avoided. 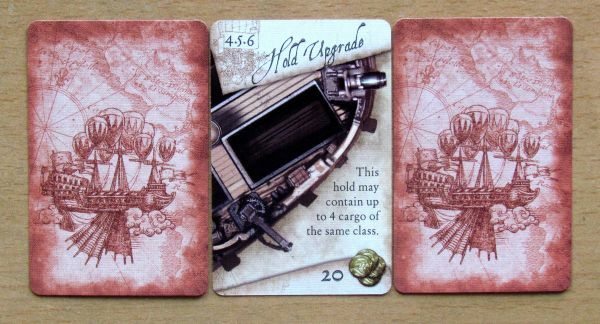 Then there are crew cards, damage cards and improvements of cargo space. 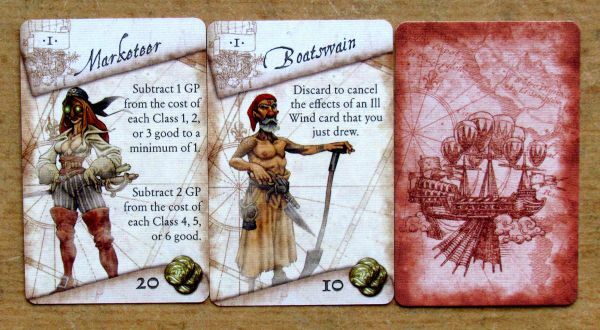 Larger (in Ill Wind cards way) is one lone with key picture – it servers as starting player indicator. And the rest are just piles of tokens. The most interesting are the barrels with goods in eight colors. They are well chosen and distinguishable from each other. 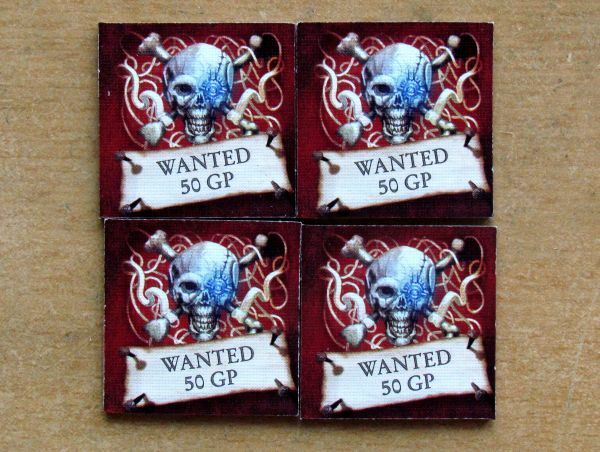 There are also several square wanted tokens, which you can become during match, and of course money in five different coin values. They are called piastres here. The final component made of the cardboard is eight oval tags used to highlight the current prices of tradable products. 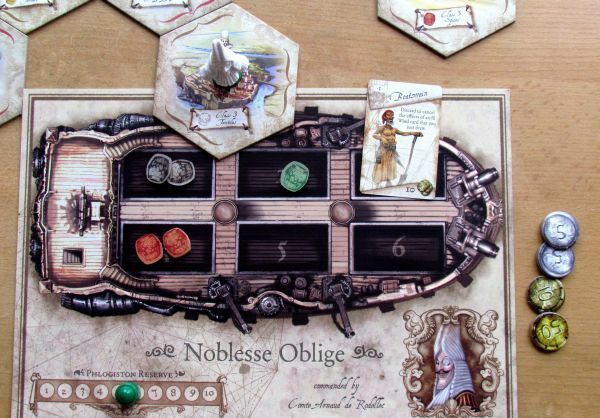 But we totally forgot about the caps, which indicate influence points and also supply of phlogiston on your ship. 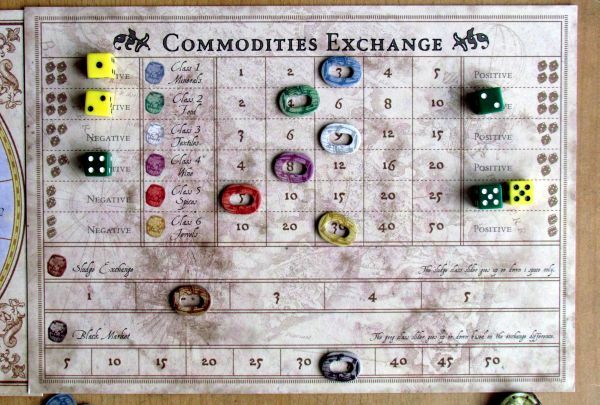 In conclusion, then we also have to mention trio of colored dice for each player, usable during combat, but also in one of the most important activity of the game – bargaining for price of goods for upcoming turn. 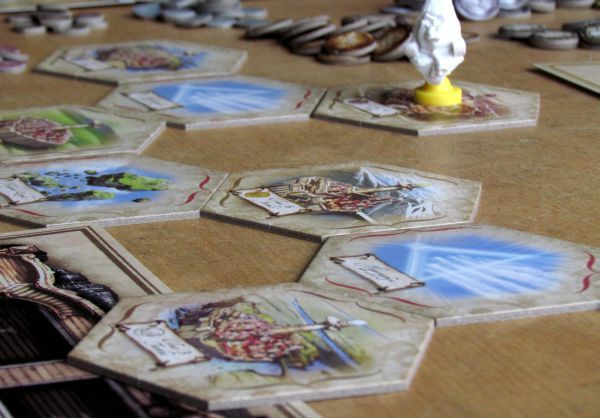 To begin playing Sky Traders, your first need to prepare the world map on the table. 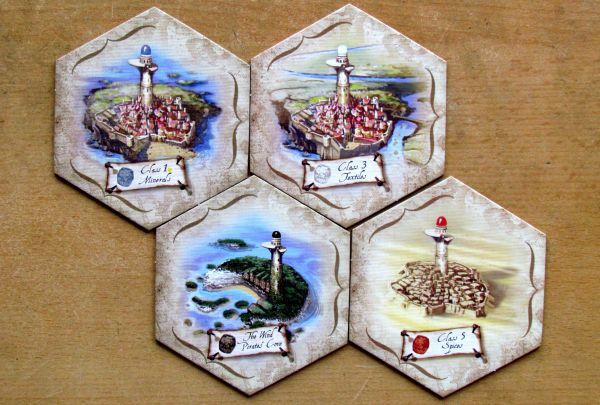 Hexagonal pieces are dealt among players and they then take turns playing them on the table. 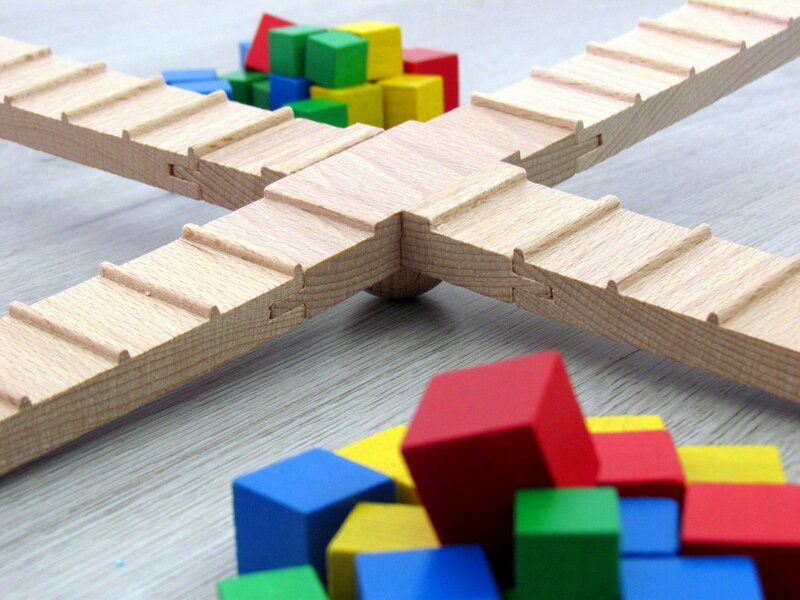 Their playing follows few basic rules – most important is, that arrows on the sides must always connect brown to red and vice versa. 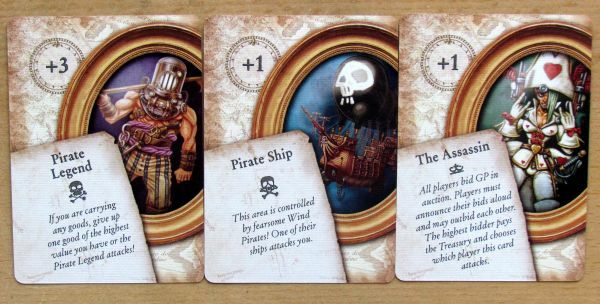 Now we just prepare all the decks and piles next to the map, only crew cards should be split by type – persons are not drawn randomly, but recruited. 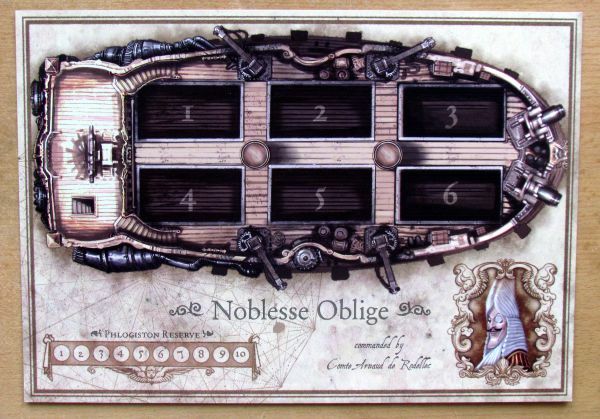 Each player takes one ship card and also all the corresponding colored segments – one bust and two hats. He lays one on the influence counter on zero and the other on his ship – it was fully tanked with phlogiston up to maximum ten. Each player gets twenty piasters and one man in the crew. One of depots is thereby made into a cabin and it cannot be used for transporting goods, until you let employee go. Now only market has to be prepared, with its starting prices. You take ellipses with a hole in the middle and all lay them to the leftmost position with lowest value. The only exception is the value of the black market, which will be the biggest production – fifty – the most right. 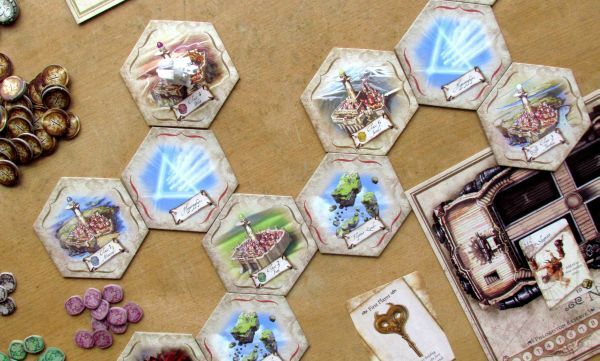 Players randomly determine (by throw of the dice) their starting position in one of the six available cities. Preparation work in Sky Traders is done. Surprisingly simple, is not it? The good news is, that the game itself is also that simple and complex things begin to sail up only, when you start to think over the best way to victory. And rules will not concern you. 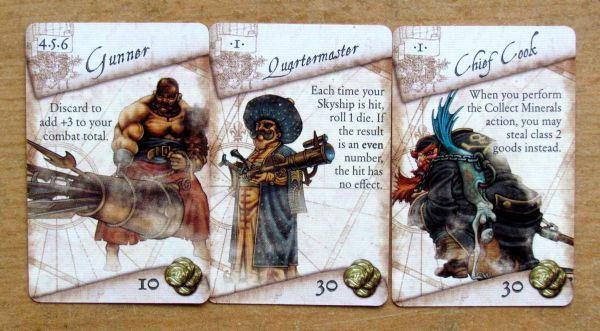 At the beginning of his turn, each player reveals one of thirty Ill Wind cards, reads it aloud, and follows its text. This is the end of peaceful part of turn. Remaining three phases have a time limit set to two minutes together, as is said in the rules. It is mainly for the smooth course of the game, so no player hesitates indefinitely with his decisions. First, player can move his airship on one of the neighboring fields. The distance traveled by the ship is determined by the player himself, by price he is willing to pay in fuel. 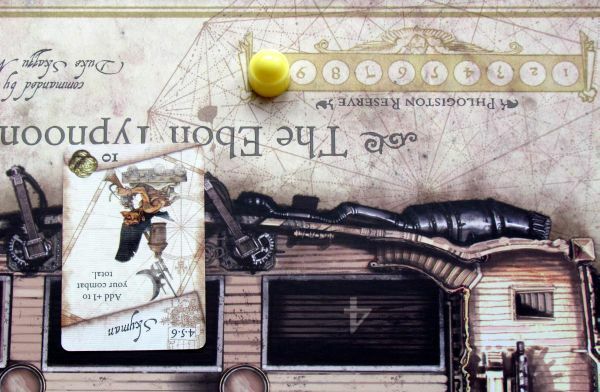 Up to a distance of three is distance directly equal to the amount consumed phlogiston (1-1, 2-2, 3-3), but if the player wants to travel further, his spendings increase – for four positions its five phlogiston and for five units ten – that is the entire tank of the airship. Faster movement can also be made through hyperzephyr gates, acting like portals. 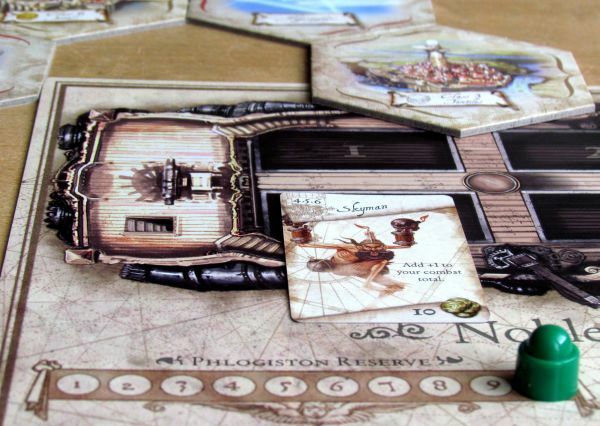 The third phase of the turn gives players the opportunity to just get rid of cargo or crew. It does not cost anything, but you gain nothing for this activity either. You only make space for additional cargo, before the last and most important phase comes up. This is place, where you can choose one of four possible actions. Two of them are available at all times, while trading can be carried out only in city. Each city is wearing a type of material, which it produces and sells. All other goods can be sold for profit there. Moreover, you can also fill up your phlogiston tank, hire crew, buy improvements of cargo space or repair your ship after some battle. Free mineral extraction is also possible only in a city space. Simply throw two dice and you will find equal number of the cheapest mineral, which can you load into your ship for free. If you manage to roll two identical numbers, you get also valuable jewelry barrel. The other two options, which can be done anywhere in the sky, is mining clouds for phlogiston or attack on one of the competing airships. The first option is a simple extraction of clouds. Thanks to this, you can never become stuck without fuel. It will only cost you extra time to refill your fuel tank. The final piece of the puzzle is obviously battle between two airships. 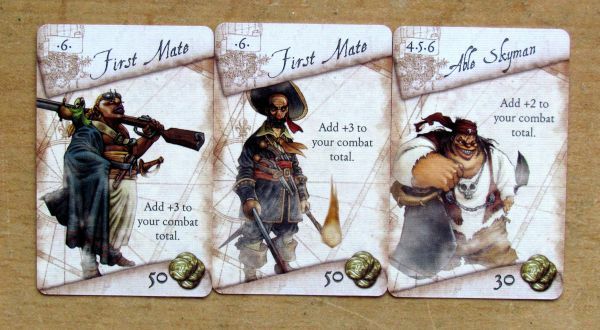 This takes place with the help of dice and cards, when you gradually select your crew members. Not simultaneously, but in turns. 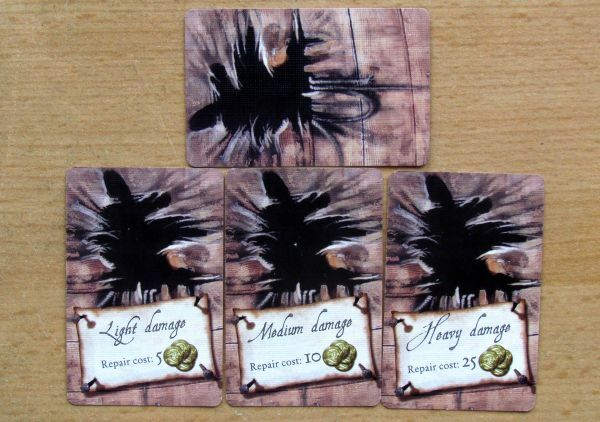 Each player sends one man into battle with one dice roll – lower sum gets ship damage. At the end of each round, all players will be able to vote for market change. Players roll three dice and can assign them in row of the value rolled. It can be put on left or right side, depending on where you want the price to go – up or down. Once everyone played his dice, votes are evaluated and prices are shifted accordingly. The game end is simple – you can win by reaching the point of fifty on influence track. Those positions are getting more and more costly, as you get to the center. But after the market prices adjustment is the only time, when you can spend your piasters and buy influence in the Sky Guild. Once a participant reaches the center of the spiral, its last round for everyone. If there were more players, who reach 50 in one turn, then money and value of goods is the tiebreaker. As you can see, Sky Traders are actually really simple game with a lot of business strategies and the possibility to influence the price or trade only a particular product. Stocks are not restricted, so everyone can easily trade with the same raw materials. But since you can always buy it only in one place, you would most certainly be more flexible than that. 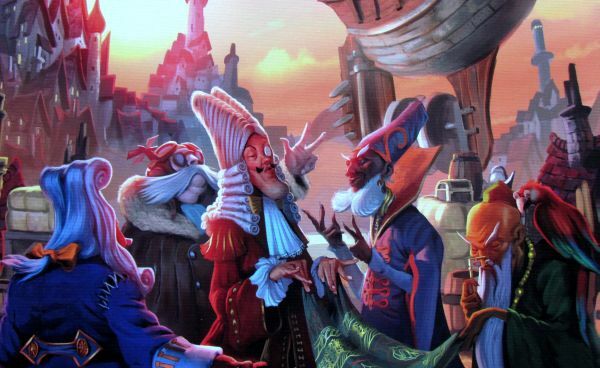 But money can be earned in other ways – like catching wanted pirates (players) or get waste out of the city. Both of these illegal activities may get into trouble, because even peaceful traders can get a wanted token, if they commit some crime – attack a peaceful ship or dump toxic waste into a city. From that moment on, you are wanted and others are not penalized for attacking you. They get big reward instead! Great importance is put on the change of market prices, which happen at the end of each round. 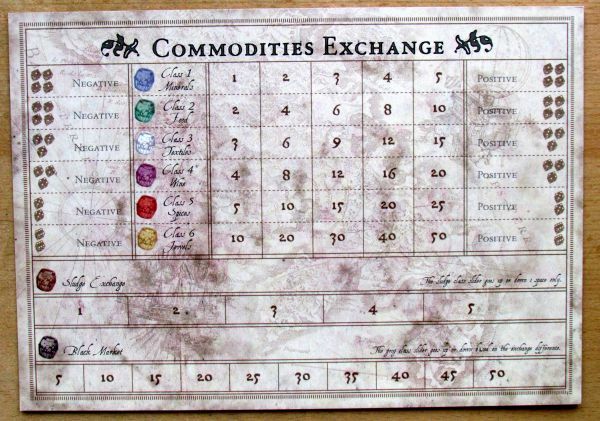 Here players can significantly affect the price of their current goods and barrels, or lower price for cargo of others. 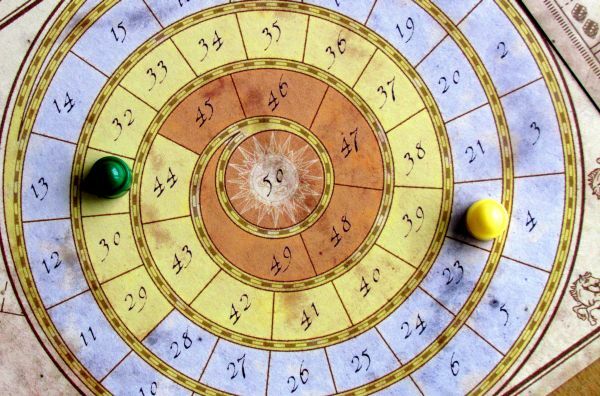 It is important to have a bit of luck here, because you have to rely on the numbers, which you roll. But as you gain influence, you can gradually control some dice results. It is important, that all players vote and everyone can put his vote to any side – plus or minus of the number thrown. So you can actually ultimately benefit from each dice and it does not matter, which number you rolled. You must simultaneously monitor position of your boat to know, how you can take advantage of changes of values in your favor. 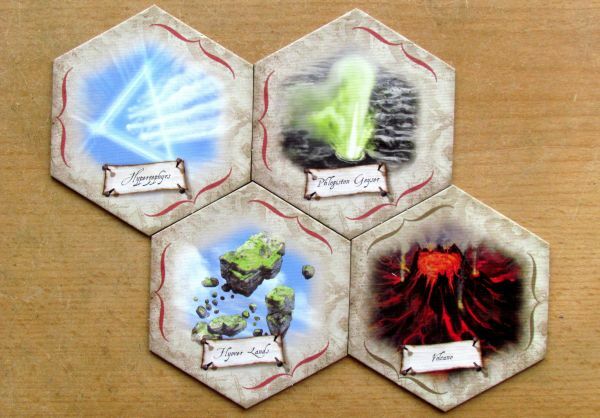 Battles are indeed part of the game Sky Traders, but it depends only on players, whether they will attack each other. Therefore, you do not have to, worry if you like strategy games and do not like to be forced into battle. In this case, you can experience a truly peaceful game, disrupted only with occasional sneaky Ill Winds cards. They can even attack you! Luck will have large impact on your experience. It is present in several situations. 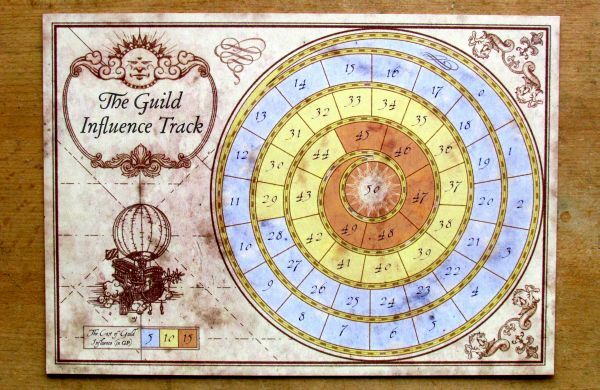 The most significant and visible at first glance is drawing of Ill Wind Cards, which can cost you a lot. The event always refers to the player, who drew it, so it can be costly. Similarly, there is coincidence in combat, but that does not happen as often. But when it happens, others may seem it a bit lengthy. Conversely luck is no problem at the polls on the market prices, where you can even exchange the dice with others and negotiate. This is the best feature of the game, but without the other components, it would not do the trick. So if you do not like chance – be careful. 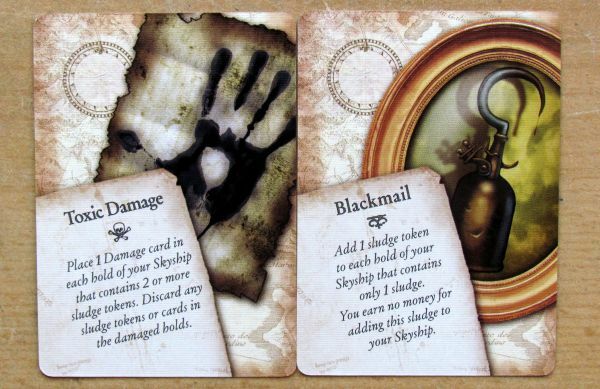 On the other hand, in revised rules there are ways to avoid some random places (like payment for removal of sludge). The whole game looks really great. I have read somewhere, that it is perhaps a little too cute. For us, there is just right amount of those colors and unusual illustrations. 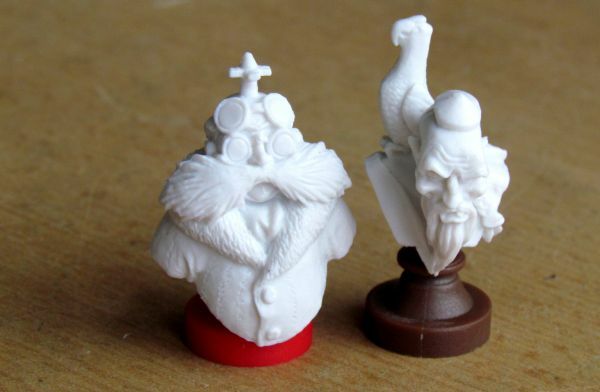 In addition, everything looks very nicely spaced and feeling is enhanced with captain busts. A+ for processing for Sky Traders. The only thing, which seems like a downside, when it comes to less experienced players, is rather long game time. 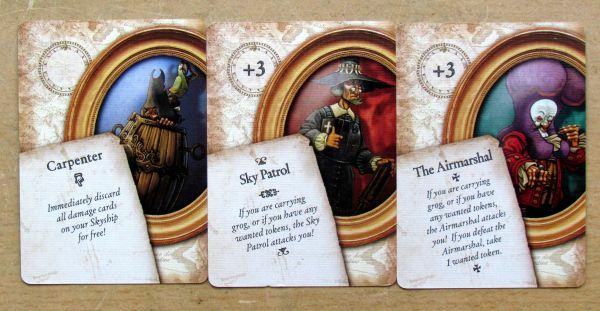 One game of Sky Traders may take up to two hours of your times, even though you apply the principle of two minutes per player turn. And it may seem too much, although it seems like a fair time for such complex trading game for us. All the time game changes and you experience interesting game development. 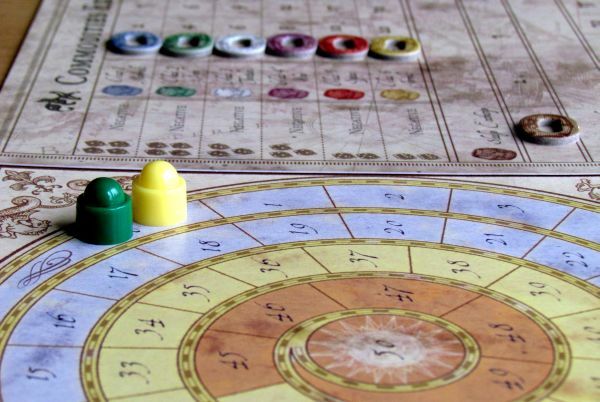 Fortunately, there is a modification in the rules, which will shorten the game to about two-thirds and approach this one hour magic number – this rule reduces costs of influence boxes. Rules theselves are simple, yet they were a few minor shortcomings, which were fixed by publisher after game was distributed. In particular, there is a value of the black market, which is supposed to start at zero according to original rules. Of course this is changed to fifty, just as we have described in game preparation. The second important change concerns the limit of dice, that can be added to the poll, when voting for prices. 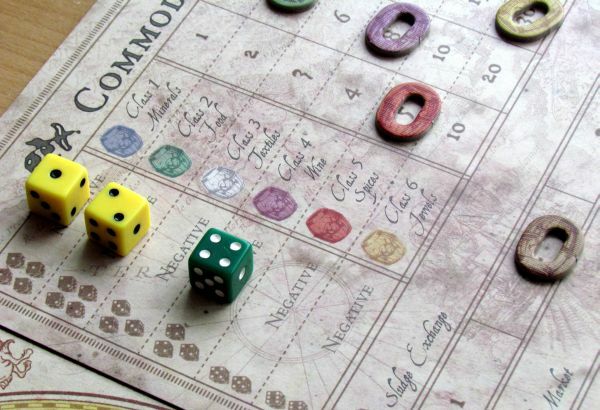 Now you can put up to four dice everywhere, but only some of them are counted for the purpose of shifting goods value up and down, so there are no rushed changes. 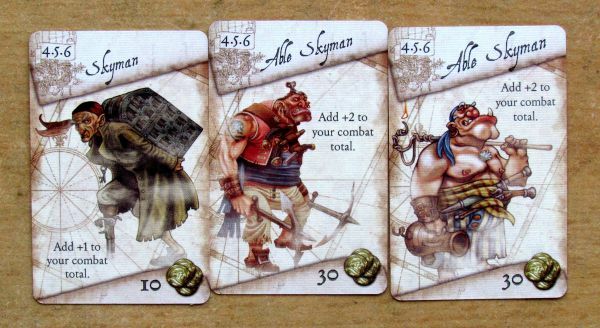 Sky Traders seem complicated, but in fact they are simple strategic business game. Load, transport and sell raw materials, exactly like an economic game should work. 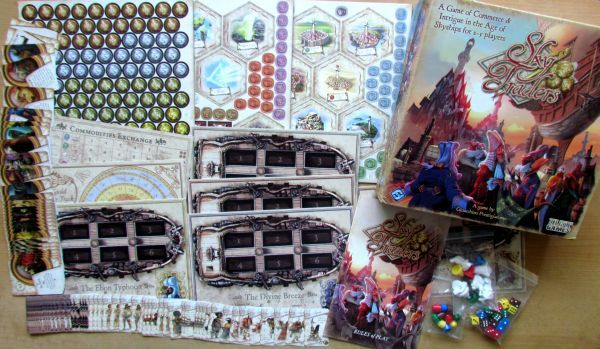 You can fight with your airships, hire crew and influence the market. Everything is composed perfectly, and no part of the mechanism seems to be here for nothing. Game is a little longer, which spoils the impression for less experienced players. Nevertheless, we recommend Sky Traders to all, who like to trade, whether by land, water or air. Sky Traders is a game, which will astonish you with its looks and theme. Who would not wish to become captain of an airship? Thanks to this game, you can. And you can use it to trade materials and sell them with profit in other towns. You are kind of speculants. Whole planet is dependent on fuel called phlogiston. But price of goods is altered every round by all players voting for some of them. But before you market through to the end, it will take more than two hours, which is quite long. Fortunately rules contain faster variant, which will speed things up a little bit, but you will still jump over 90 minutes per game in two. But you will not be bored during the match, there is development the whole time. Some plans might be interrupted by bad luck, when it comes to Ill Wind cards. But it has a decisive side also in battles. 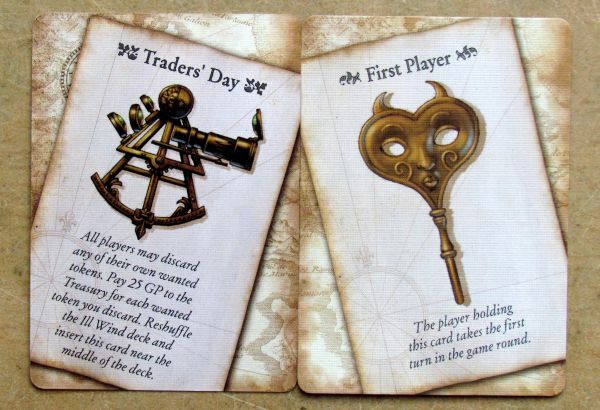 Sky Traders is a game of intrigue and trading and that is, how we should approach it. And it excels in both. Its fun. 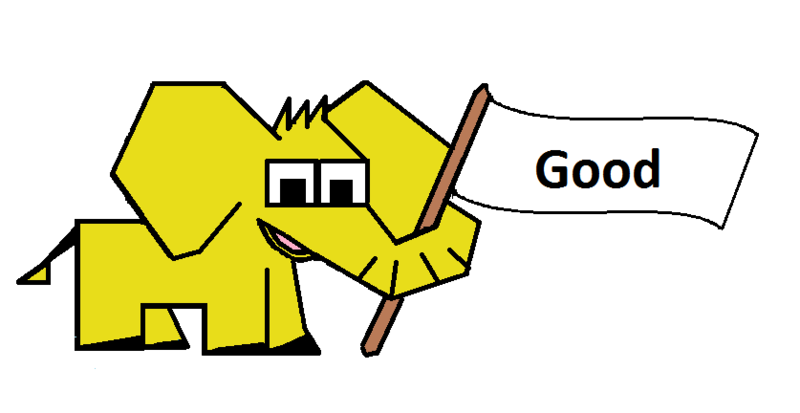 We used evalutaion with word GOOD, but its just a little bit under a GREAT tag. Only the bad luck threw it down a little. But if you like its looks and theme, then you should definitely consider buying it. It is worth trying. But do not forget - use corrected rules!